I made this chart. Several other blogs have copied it nearly verbatim, and I am happy that others want to spread actionable information to protect people (would have been nice to get a proper credit though). I had the chart translated to Japanese as I was sending a Geiger to Japan to help families address their real risk. See bottom for the Japanese version. This is a super condensed table on how to interpret Geiger Readings. Use it to supplement your own research and getting a "block of knowledge". If you take this radiation stuff at all seriously, then get a Geiger. All the rest is guesswork. Sometimes, Radiation reporting websites will express radiation readings (based on assumption of Cesium) as microREM/Hour. AS an example, if they are stating 11 microREM/H you divide by 100 to get .11mSv. This table is based on the Radiation Alert Inspector which is a fine pancake tube type device. The Clicks that any device produces are based on its own "efficiency" in detecting various types of the alpha, beta, or gamma. These can then be converted to a mSv making a huge assumption, i.e. the isotope. Usually Cs is chosen for this guess. But you don't really know the mSv until you know the isotopes involved. If you have a cheaper, small tube type Geiger, you are going to pick up less Clicks. And Here are LIVE radiation reports from independent reporting stations. I am sending my Radiation Alert Inspector to Japan to a family that needs real data---soooo You won't see an Oahu based reporting station until I get my next Geiger delivered. Hi Stock. 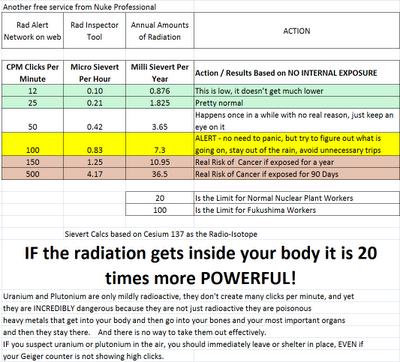 Are you able to explain the discrepancy between Bob Nichol's Your Radiation This Week and http://radiationnetwork.com/ above? 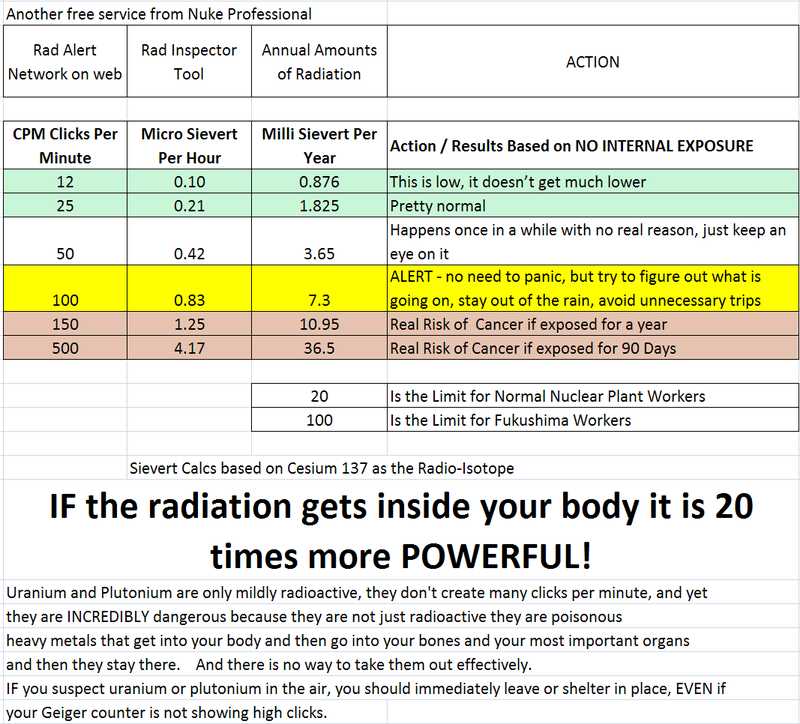 Simple: He is using the EPA reports that include very sensitive gamma radiation reading (in 8 different energy ranges incidentally), compared to radnet which is comprised of VARIOUS Geiger counters, that are catching some Alpha, but mostly beta and gamma and they are not as sensitive. So a CPM means little unless you the type of Geiger that took it. Seeing 50CPM on a nice Radiation Inspector Alert would not be a "take action level" but if you have an el cheapo $160 Geiger, and you are seeing 50CPM it may very well be a "figure out what the hell is going on" moment. stock here: Simple: He is using the EPA reports that include very sensitive gamma radiation reading (in 8 different energy ranges incidentally), compared to radnet which is comprised of VARIOUS Geiger counters, that are catching some Alpha, but mostly beta and gamma and they are not as sensitive. Saw your post at HP. That's wonderful news your sending yours to a family in Japan Steveo. Thanks to you, they'll be able to measure the radiation around them. HUGS to you! Yeah It was kind of an epiphany on Saturday. Do you know what the readings are in the Hawaiian Islands? Thanks for the important info! I too am trying to make sense of the data. We used to measure radiation in RADS, now it's called millisieverts, microsieverts, bequerals and terabequerels (X1000 to the 10thpower). First you measure the "background" radiation that "normally" exists (ie, from microwave ovens, cel phones, wi-fi etc. )then measure your item (the vegetable at the grocery store or the paper towel from which you swiped radioactive rain off your car)-- subtract the background reading to get your result. The "standard", which a human body can withstand, was set at 0.05 millisieverts. 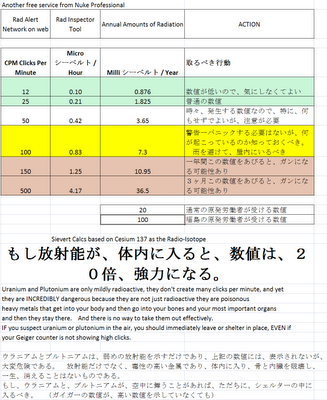 Now they've raised the standard so we can "safely" absorb more radiation, (by the way, the black yetch on the streets in Tokyo is measuring in bequerals) My guess is that the industry is purposely confusing us with measurements since no amount of radiation is really "safe". Yes, I too would like to make sense of all this. 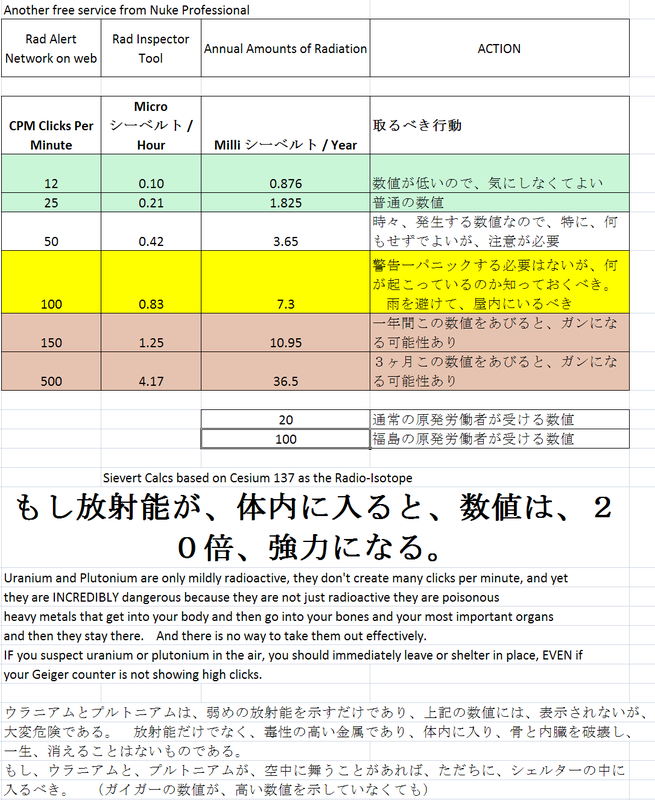 I'm learning that many of the geiger counters don't even measure cesium, strontium and plutonium, which is what is coming our way from Japan. Thanks for stopping in, and for making efforts to understand this stuff. All your comments seem on the right track. Food is very hard to measure, the water stops most radiation, but if you do get a high reading on food...very bad sign. Normal radiation sources are deep space, the sun, rocks & minerals around you, etc. NOT microwave ovens, cell phones, wi-fi. These emit "radiation" but they do so much lower in the electromagnetic spectrum and do not emit alpha, beta, or gamma. Repeat: Microwave ovens, cell phones, wi-fi, etc. do NOT emit *ionizing* radiation and are not of concern at ALL in this discussion. None of those "radios" (or EMI sources) are truly digital in the sense that they only broadcast on one specific frequency, except perhaps some SMARTmeters. What you might be measuring could be harmonics of the main "transmission". If you don't believe me, obtain a small battery-powered AM Radio. Tune in to a strong frequency about mid-dial near the center of the room. Then move it close to any WiFi antennae, operating Microwave oven (with a cup of water inside for instance), LCD-TV, etc., etc., etc. In short, you are wrong, but not for any of the reasons you cited. Also, if anyone can generate any ions, or charged particles, from such emissions, would that not technically be "ionizing" radiation? Due return when you have enough knowledge to best a McDonald's worker, eh? Fukushima Tsunami Meltdown Debris Field ETA America Summer 2012? Great stuff, I am posting these up as their own post on my site. Thank you for your time and hard work. It is greatly appreciated! Thank you so much for all this resource. I like your practical approach and simple language. Decipher the technical BS and put it into straight forward terms. Appreciate the appreciation! im going to spread the word ,for years I was pro-nuke .Its nastier than raw sewage. I thank God for the truth. Nuke makes raw sewage look like fine art. -- Chernobyl increased exposure globally, cerrtain areas are hot spots of activity and research in those areas is proving -- as if it needed to be proven again -- that Nuclear is lethal and should cease entirely. Only one test - western medicine -- is repeatedly done for people with cardiovascular disease. It's so high in exposure that if included and averaged for all USA citizens,,, amounts to 3mSv/year!!!!! inhalation or exposure to airborne radionuclides (cloud shine)." (pg. 23). World Health Organization. Health hazards from radiocesium following the Chernobyl nuclear accident: Report on a WHO meeting. Environmental Health. 24. Missing "food and water, internal exposure, is 1,000 x worse"
For international readership, am including translations of the title. That was just the forward translation. There are bound to be inaccuracies. Those might be reduced via reverse translation & rephrasing, "rinsing & repeating". Quote of ISPC: "Maybe I will build inexpensive Geiger Counters and give them away." Do tell. How can i be a Do It Yourself'er for educational purposes & for charity? "Geiger Counters are pretty useless if you want to deal with the real thing: Radionuclides in food. Air radiation is not representative for radionuclides in food and soil. 27 Chernobyl years and people still don't know this and do not measure their food." Suggest people form communities, familial, civic, church, to get the right equipment and testing soils, food and water for alpha beta AND gamma. Internal exposure thru food and water is the most hazardous. To protect yourself, simply, Dr. Rosalie Bertell suggested drinking distilled water between meals and supplement with spirulina... these draw radioisotopes to it for elimination. With Meals, supplement with calcium/magnesium.... 850 mg/350mg, respectively, (half that for a 10 year old) is the advice of Chris Busby. Add antioxidants. @Marushka France - Bonjour! I like your constructive criticism. Would thinly slicing & dehydrating foodstuffs ease detection? Am looking for simple Do It Yourself projects utilizing common semiconductors such as 2N2222A (etc) powered by +5VDC (USB) to output via headphone adapter for desktops & laptops? I understand the utility would be limited, like the bandwidth, to Gamma, and some beta. In my mind it is better than nothing. Am looking for something very simple that does not require any programmable chip, yet can use simple ic's such as comparators and discrete components. It need not be very accurate. Am thinking +/- 20% would be ok for a "kids toy" for people whom have very low income. That would be combined with freely available pulse recording software, such as Marek Dolleiser's "PRA" (University of Sydney). At the moment, it seems leadership here is content to let us eat yellowcake, so-to-speak. Quote: "Emergency radiation testing used at Democrat and Republican conventions after Fukushima; Also for Obama Inauguration — Seafood, meat, vegetables, milk, water checked for nuclear waste, while top officials agree to publicly downplay crisis — 80% of milk samples by Orlando, FL had ‘significant’ Cs-137"
I will close my mouth and open my ears, so learning can begin. I appreciate your opinions, Marushka. Merci beaucoup. There appear to have been attacks on enenews people from Oak Ridge, if that is correct. Stock might be a little preoccupied at the moment. Many were infected. There might have been a BIOS attack too, yet that is as of yet unconfirmed. See: http://nukeprofessional.blogspot.ca/2014/11/virus-laden-troll-links-at-enenews.html & http://nukeprofessional.blogspot.ca/2014/07/low-quality-troll-invades-enenews.html (etc) That last link seems to link at least part of the "malefactory crew" with the address 50.142.165.12, and there is a picture there too. Closing mouth, opening ears .... over to you sir. I was wondering what happened, there. I posted a comment, then decided to post a reply to another enenewser, and got a 404 error message. I could still go to and read ENEnews, but could not post responses. I wonder if it's one of the pro-nuke jerks (which may be on in the same) J-anAlex or Metalhead? I just got my geiger-counter, and my bedroom is in the high-teens; kitchen in the mid-twenties (food? water? who knows?) I was thinking I'd test food while I'm waiting to see when I might need it. Always want to be prepared..
What brand and model Geiger did you get? Follow up Q?s, Stock: Considering that Nichols states that the readings he is citing are not the whole story, either, ie: understate the actual, is there any public access source to your knowledge that gives a more complete reading? Do you think that Nichols is in effect 'mixing apples and oranges', as it were, by including a 'normal traditional background' as say five to twenty CPM, which sounds like what lower end geigers might indicate, with EPA extremely sensitive technology? To put it another way, what would that EPA technology posit as 'normal background'? His numbers seem at first glance extremely disturbing. How do they strike you? Thanks, Oldster. Oldster, watch the youtube by antiproton, it will double your knowledge in 15 minutes and never have to be uncertain again. In regards to "Seeing 50CPM on a nice Radiation Inspector Alert would not be a "take action level" but if you have an el cheapo $160 Geiger, and you are seeing 50CPM it may very well be a "figure out what the hell is going on" moment" - I have a reading of 390CPM taken with a Smart Geiger device on my iphone. Is there any translation to the real world? Thanks! I recently measured 344 cpm a b and g from the sap of a dieing tree. Seems way too high not to be manmade. Background was 34cpm , and the Inspector plus was used.What might be happening here? Interesting. No experience in sap, but did you dry the sap, just curious. Try same test but block the alpha window. Then try using a beta blocker, like some thick heavy material....I prefer lead because I have those sheets on hand for solar work. Then some sleuthing can occur. I tested dried crystalline sap on a piece of bark from the same tree. Alpha at 22 cpm beta at 163 cpm gamma at 40 cpm. Very nice chart, I would like to translate it to German and post it on my website, with reference to you, is that okay? thomas, sure go ahead, provide a direct link back to my site. Radiation readings TODAY in Aromas, CA. And no one listens. Maybe everything is 'just fine' like I have been told. Both my dogs just died of cancer. Of course there is no connection. Do any of you have dogs. All they want is to be loved. They were better than all the experts. I have granite counters that produce 200+ CPM with a an Inspector plus, external probe laid directly on the surface. Should I remove and replace them?Seems high per your chart. If anyone wants to stop by and check this out, PLEASE DO! I am about 10 miles from the coast. Japan is firing up more incinerators. Most likely the readings will steadily go up. Does anyone else have readings this high? How do you even know background at these levels?